Michele Thomson will be relying on her caddie’s eyes rather than a green-reading book to try and master “extravagant greens” in this week’s Hero Women’s Indian Open. The Aberdonian is bidding to go one better at DLG Golf & Country Club near New Delhi after recording a career-best second-place finish in the same event last year. 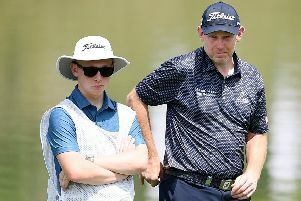 Thomson carded a course-record 64 in the second round to take a three-shot lead into the final circuit and was leading after 15 holes, but eventually ended up a stroke behind Frenchwoman Camille Chevalier. “I’m super-excited to be back,” said Thomson, who is flying the Saltire in the event along with Carly Booth, Kelsey MacDonald and Vikki Laing. “The course has obviously been lengthened a little bit this year, but it feels like the same kind of place and I’m excited to get going. The highlight of Thomson’s 2018 campaign came when she picked up two medals in the inaugural European Golf Team Championships at Gleneagles in August. She’s sitting 90th on the LET Order of Merit, so needs a strong finish to the campaign to secure her full card for next year by finishing in the top 80. “I’m approaching it in exactly the same way as last year,” added the 30-year-old. “I am looking for a good finish. I need a good finish this week, but just want to enjoy it and play sensible. “You don’t want to be too aggressive around this golf course, but hit the fairways and the right parts of the greens and you’ll be scoring well. “I just want to enjoy the week and the same kind of outcome as last year would be ideal. “I’ve got one of my friends, Jenna Hunter, who plays on the ALPG and is a New Zealand PGA Pro, as my caddie. UK fans can watch all four rounds live on Sky Sports, as well as on the LET website and Facebook channels from 8am BST.